Greg La Follette has one of the most rigorous academic backgrounds of American winemakers, which is how he knows that it's important to keep his winemaking feral. Here's a guy so closely associated with UC Davis, where he earned a Masters in Food Science and Technology, that he was consulting winemaker on the design of the school's teaching winery. And yet, how does he decide when to take his Chardonnays off their lees? He takes a sample of the lees -- stinky dead yeast cells -- and puts it in his mouth. Ewwwww! Chatting with La Follette is an entertaining blend of ribald jokes (“That's how I originally attracted my wife, with my big Pinot”) and very hard science (I mentioned oxygen egress of screwcaps and he started talking about a research paper he just delivered on the topic of how to make wine more or less reductive depending on the closure). UC Davis is sometimes criticized as a place where winemakers learn to titrate. But that's where La Follette did the hands-and-tongue-on postgraduate work on ancient Burgundian winemaking techniques, funded by Napa Valley Vintners, that fed a career-long obsession with achieving the right mouthfeel, ironically mostly across the mountains in Sonoma County. La Follette's first post-Davis job was as research viticulturalist/enologist under Andre Tchelistcheff at BV. After brief stints at Australia's Yarra Ridge and Napa's Jarvis, he found himself consulting for Kendall-Jackson on vine quality, recommending what to plant and where to plant it. In 1996 he became winemaker and general manager at Flowers Vineyard & Winery, where he showed everyone that great Pinot Noir could be made further west in Sonoma County, in cooler, foggier climes, than most people had previously thought possible. In 2001 he opened his own virtual winery, Tandem. Despite its excellent wines, the business had been scraping by, though La Follette supplemented his income by consulting for wineries on five continents. He designed or redesigned 14 wineries and has made highly regarded wines at Flagstone in South Africa and Viña Casa Marin in Chile, which grabbed attention with one of four “grand gold medals” at the 2007 Mondial du Pinot Noir. This year, he sold Tandem to Pete Kight, a successful Atlanta businessman who made a fortune with a paperless check system and is now buying idiosyncratic wineries including Quivira Vineyards & Winery and Australia's Torbreck Vineyards. 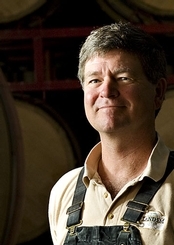 La Follette's deal gives him control of winemaking, without the need to worry about sales and marketing, and will also allow him to buy some vineyards. He will cut down on SKUs, eliminating a dry Gewurztraminer and Sangiovese to concentrate on Chardonnay and Pinot Noir. Instead of barrels or wine tanks, La Follette uses milk tanks for fermentation because they're wide and shallow, so the “cap” of grape skins on the surface spreads out over a wider area and is thus thin and lightweight. This means the cap doesn't require much power to be punched down into the fermenting wine, so his winemaking process stays gentle at a point where many wineries have stopped paying attention to force. Don't tell the child labor lawyers, but La Follette has used his 6 kids all over the winery from an early age, starting with sorting and moving up to heavy equipment. His oldest son, while still in high school, was hired away from him as a forklift operator. “He got a better offer,” La Follette said. La Follette likes the words “earthy” and “savage” to describe his wines, and that alone sets him apart from what most California winemakers are trying to do. His best wines are Burgundian in the best sense: Complex, ever-changing, with fine mouthfeel and a strong sense of place. Of one wine, he said, “I like this one because it's earthy. It's kind of got live ammo in it.” And that's a good thing. W. Blake Gray is author of “California Winetopia,” a Japanese-language guide to California wines. He was previously a staff wine writer/editor for the San Francisco Chronicle, and has contributed articles on wine and sake to The Los Angeles Times, Food & Wine, Wine & Spirits, and several in-flight magazines. Gray is currently Chairman of the Electoral College of the Vintners Hall of Fame. He lives in San Francisco, and joins Wine Review Online as a regular columnist.